Where do you get the time to…? I’ve heard it said that you will find the time for the things you value. I semi-agree. Someone asked me, “Where do you find the time to read all those books?” after my recent post on reading. The answer is a little complicated, and I’ve been thinking about it for a couple of days. First, I have value for a WHOLE LOT of things that I cannot “find” time for, in part because my time is not wholly my own. I have a family to attend to, and I’d be abhorrently irresponsible, remiss in my duties if I simply set about my life seeking “me time” (I hate that term, by the way). I can’t just set off on a stroll through the woods, alongside a meandering creek, binoculars around my neck, and my Sibley guide in hand, just because I want to. I could find the time, but if I did that, who would watch the kids? Who would teach them? Who would do their laundry? Or make dinner? Would my husband still be happy in our marriage? Would I still be able to serve the Body of Christ, and my particular church body, with leading worship in small group? For the children’s church? Would I be able to say, “Yes!” to the various church-related printed matter that gets sent my way for editing? Would I be able to contribute a wee bit to our family’s finances — by writing — if I was always pursuing the things that make only me happy? So, sometimes, it’s a matter of priorities. There are many things I value and would adore to spend more time doing, but other responsibilities trump them. And, there are some things that I absolutely adore, but if I do them, the activity devoted to them precludes my availability to do something else. You can’t always get what you want, even if what you want is a good thing. For me, I have struggled long and hard with not being such an idealist. Being an “idealist” may sound lovely, but if you’re an idealist of my tendencies, it’s not so great. I spend too much effort pining for “If only…” and “I remember when…” and that’s truly not helpful. In years past, and to some extent, even now, I can easily become immobilized by my idealism. I know the best way, the right way; I remember when the situation for “x” pursuit was much more ideal; I see, way too easily, the roadblocks that present themselves, rendering a situation much less-than-ideal. I wish for things to be much better than they are, rather than attacking what’s on my plate right now. Thus, I do nothing, rather than doing it halfway. And, that brings up another point. I love my mother so dearly, but something that has long frustrated me about her outlook on life, is that she looks at her plate, and with a resigned sigh, remarks, in the Christian way of how she’s fated to eat everything on it, “Well, I guess that’s just what God has given to me, and I need to be thankful for this, and deal with it.” That can be GREAT, in some instances: She always makes the best out of what she has. But, on the other hand, I’ve seen her eat things on her plate that really should be relegated to the garbage bin. Metaphorically, of course. Well, not even metaphorically! I grew up thinking mothers liked burnt toast. I don’t know if this is tracking, but what I’m trying to do is find the balance between taking everything in life as it presents itself –the good and the bad — and the idealism that can envision a much, much, much better present, as well as future. Idealism can also lead me to a dark place of discontentment. Instead of “self help” or “inspirational” books (or people) inspiring me, they almost invariably seem to bring to me to a painful realization of how not great something is in my life, how not great I am, how less-than-ideal I am. And, rather than that bringing my thoughts to a loftier place of aiming for what’s better, it discourages me about where I currently am. Though, sometimes, discouraged or not, I know I have to pull up my boots with those proverbial bootstraps and change. But, that’s another topic. Sort of. Into all of the semi-confusion above enters my love of books, though the same could be said for MANY pursuits I have enjoyed (and continue to enjoy, at a now-modified pace): playing guitar; hiking (or just walking); writing; birding; spending time with friends — especially conversing, one on one, in the dim corner of a small coffee shop; listening to music (recorded or live); having devotional time with my Savior, et al. When I was a child, I was a voracious reader. VORACIOUS. I read just about everything I could get my hands on, which was usually at least a book per day. My mom took us to the library weekly, and our limit, per child, per trip, was six books. I always finished mine, almost always before the date arrived for our next trip, and usually helped myself to my older brother’s stack… That stuck with me through my college years, and into the time before I was married. After marriage — though this sounds ridiculous — one of the toughest things I had to adjust to was my new lack of time for reading. I was used to curling up, virtually every evening, with my current novel. My hubby watched TV in the evening. I was aghast. Add that to my new responsibilities of keeping house and treading the tumultuous waters of a new marriage, so books went out the window. When I was pregnant with my firstborn, and not working, I read more books during that time than I had in the previous two years of my marriage. After that, babies took over. It wasn’t really until about four years ago when I started reading again, in earnest. In other words, I spent a good eight nor nine years saying to myself, “Well, I guess I just can’t read.” Because of my habit and preference, in my mind, I had to have chunks of uninterrupted time during which I could devote all of my attention to the tome in my hands. I didn’t have multiple hours of spare “me” time. Thus, I read very little during that era. Any reading I was able to accomplish was done with a chip on my shoulder, about how much I “couldn’t” read. I satisfied myself with the many delightful children’s and young adult books I read to and with my children, whilst homeschooling. There have been MANY good books we’ve discovered as read-alouds, but I almost never read books of my own choosing, for my own pleasure or benefit. Pick up a book while nursing my baby, instead of flicking on the TV. Read a chapter or two after everyone else had gone to bed. Bring a book to a doctor appointment, rather than planning on reading the magazines on hand. Bring a book to a child’s sports practice. Bring a book to read while my children were at the park. Read a bit while sitting on the closed toilet, keeping my youngest company while s/he bathed. Reward myself with a short time of reading when the to-do list had been successfully tackled, in those few minutes remaining before I started dinner. Even bring a book into the bathroom (something I had NEVER done, previously). So, rather than consuming a book in a day or two, I now savor it a sip or two at a time, taking usually between one and three weeks to complete a book. In that manner, I am able to get 25-ish books completed, yearly, that would previously have gone unread, because of my “inability” — my lack of time — to read. I’ve always had a value for reading, but I had to toss out the ideal — my experience, habit, and preference — in order to find a new way to accommodate a book or twenty-five. And that is how a woman, wife to her husband of 17 years, and a homeschooling mother of five, who makes dinner from scratch nearly every night of the year, whose home is tolerably clean, and who has multiple responsibilities at church, and some dear friends, finds time to read. My friend and author*, Marietta, has a new blog up! Brushed By God, which is also the title of her new book, which has an expected publication date of August 1, 2011, and will be published by Destiny Image. Marietta’s blog will be a mixture of excerpts from her upcoming book, current experiences, teaching, and more. She heard from someone from the publisher today, and they said that they will probably use some of her art for the cover, which is fantastic. We had hoped that they would, but since they’re the publisher, they could choose not to. I’m helping Marietta with the website, so if you have any suggestions, leave a comment, either here, or on her blog! Fiala’s second birthday. Precious girl. We have no pictures because my camera is totally broken now, and the grandparents forgot theirs. We had a simple cookout party with family at the park on Saturday. Between Friday (her actual birthday), and Saturday, she received a grand total of three presents, each simple and inexpensive… but her face is such a delight when she receives a present. I think she really understands the heart of gift-giving, and she feels so special and thankful, no matter what the gift is, which makes it all the more delightful to give something to her. The new Sherlock on PBS Masterpiece. It was so wonderful! I really enjoyed Benedict Cumberbatch (what a name!) on 2008’s The Last Enemy, aired on Masterpiece Contemporary last year, and he was even better as a 21st century Sherlock. My husband wasn’t so convinced he’d like it — he’s a big fan of Jeremy Brett’s Sherlock portrayal. But, about ten minutes into it, he said, “OK. 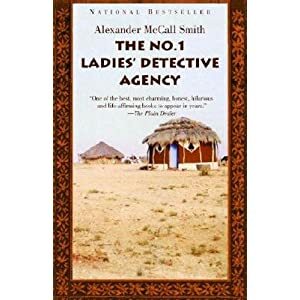 I’m hooked!” Not giving too much away, but if you know the story of Sherlock Holmes, the one problem I had with the storyline/script is that it HIGHLY inferred that one character was so-and-so, but it turned out not to be the case, but another slightly lesser-known character. I felt a tad manipulated, and I hate that in movies/TV shows. Still. It was really good. The cooler weather in Phoenix. Mornings in the 60s. Days in the 80s or occasionally a bit lower. ~sigh~ I’ve been waiting for this!! Getting a couple of bird mysteries solved, via a birding listserv I just joined. Yes, that is a Eurasian Collared-Dove I saw; as an introduced species, they are heading westward. And, yes, Anna’s Hummingbirds can hybridize with Costa’s. The author of the book I ghost-wrote signed her contract. This was after long weeks of (slow) negotiations. She got some things altered for her benefit. Good for her!! Expected publication date is August 1, 2011. 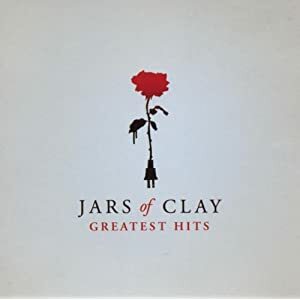 The Jars of Clay Greatest Hits CD. I have a couple of their CDs. I’ve been a somewhat-fan over the years. And, this CD is two years old, so I’m behind… (as always, with music) But, what a great CD this is!! I spied it at the library, and I’ve been greatly enjoying it. All my kids like it, too. I’ve been belting out the songs at the top of my lungs as we’ve traveled to and fro these last couple of weeks, as I’m familiar with all but three tracks on the CD. It’s eminently singable. I’m not normally a huge fan of retrospective type albums, but for someone like me, who enjoys Jars of Clay, but who does not own the whole collection of their discs, it’s perfect. My oldest son, Ethan. He’s not a “thing”, but I have been so enjoying his growing-up. He is 13. In June, he stepped up to the youth group at our church, instead of the kids’ church… He was unsure about the transition, but he’s really enjoying it now, and I think it has lent to his already-thoughtful nature, learning things and considering subjects that need some deeper maturity. He’s a boy of few words, so it’s difficult to get a long conversation from him. But, in our exchanges, I have been delighted in the evidence of his careful thought and kind consideration of those with whom (or of whom) he speaks. He’s not perfect, of course, and there are a few things about him that make me wanna pull out my hair. But — similar to my husband, of whom I have the same confidence — Ethan is faithful to work on the areas of his life’s garden which need weeding. If you point out an error, he genuinely takes steps to improve, even if initially, he’s not all that receptive. He’s a son to make a mother proud, and I love him so. Although I had been content with the material we had, prior to the “beefing up”, I must now admit that Mr. BAM knows what he’s talking about; I am profoundly happy with the new material written, and am now deeply pleased with the result. It was, indeed, what the book needed. The author mailed a CD*** of the manuscript — now 12,000+ words longer — on Monday. It was received by Mr. BAM on Wednesday, who then said that he’d reply by next Friday with his thoughts on the book. So, next is contract negotiation. If you’re reading this, and especially if you know me in real life, and even more if you know the author in real life, please be praying that she is presented with a reasonable, solid contract. It’s not like she’s expecting to get rich off of the book, but I do so want her to be treated fairly. Well, actually, I want the publisher to be generous with her, but that might be too great an expectation. But, we continue to have favor with both God and man, which is very exciting (and has led me, in recent weeks, on a study of Nehemiah — who also had both — but that’s another topic altogether…), and leaves me with hope and an expectation that God will not let my dear friend down. *Ghost writing varies a lot. In our case, all of the ideas (or a good 98% of them) were the original author’s. All of the teaching is hers. All of the stories are hers. I took her work, organized it, edited it, honed the focus in places, expanded it in others, and re-wrote virtually every word. My express goal was to have her read it and exclaim, “Yes! That is exactly what I was trying to say! Only now it sounds even better!” Mr. BAM said it this way: my friend is the author, and I am the writer. ***Normally, mss are just e-mailed, but since this one contains a lot of pictures, the file was too large. Today, we completed four errands in just under three hours: bank, library, Costco, and post office. We got back in time for lunch, which was my goal. I am now exhausted. It’s the heat, I think. And just having five kids in tow, two of them in carseats. It just wears on me. But, it was a good outing, and only one of the children got into any significant trouble, which, by the odds, isn’t so bad. 🙂 I can’t wait until it’s cooler, and we can add hiking, or at least a trip to the park, back into to our Fridays. I’m finishing up the additions to the manuscript I’ve been working on. The “book acquisition” guy at our publisher liked the draft, but wanted more of it, and had several good ideas to expand the book. His suggestions, plus some other stuff that the Holy Spirit “downloaded” to Marietta (as she describes it), have accounted for some wonderful new content. Every year, my church hosts an international leadership summit. In its first years, when it was smaller, Marietta (the book’s author) would paint a watercolor with the theme of the retreat, one for each attendee. The last few years, as our numbers have grown to 50+, she has done one watercolor, and given everyone a nice, framed print. This week, she mentioned that she is so hoping that the book will be published by the date of the next summit (late January 2011), so that she can give a copy of the BOOK to everyone. I got so excited about that, I squealed and was giddy. Note to self: Assume less, check first. I completed a whoppin’, time-consuming blog entry with all of my friend Kathy‘s recommended teen books, with about 75 links in it. Then, just as I was about to click “publish” I thought, “Maybe Kathy would like to give this a look-see before I post it!” It turns out my sweet friend is working on a series of posts on the same thing for her new blog, complete with mini-reviews of each book… My heart sank, as I realized that I hadn’t even considered, while I was writing, that the list might be “proprietary”, so to speak. So, I offered to hold off publishing it here, and I will happily link to her posts, when they’re completed. 🙂 Ah, humility… You’re a hard one for me to learn! Perhaps this should be a separate post on its own; I hate to see it get buried in the bullet points, and I truly hope that a number of you click on these: On Wednesday, I read my friend Nicole’s post on “The Wonder Woman Syndrome” or, women turning 30, and growing up — or not. Yesterday was her 30th birthday. Earlier on Wednesday, I had read a post that deeply resonated with me by my friend Kathy, about the treasure of having older friends — there’s more to it than that; it’s hard to describe briefly, and the Miss Talaaant parts are priceless. AND, related to those two, rolling around in my mind, was a real nugget of truth that was shared (via video) in the final session of the Beth Moore Bible study on Esther I’ve been attending on Tuesday nights at my church. Beth said, “In man’s realm, time diminishes beauty. In God’s realm, where we will spend forever, time perfects beauty.” (Eccl. 3:11) In a culture that worships youth and beauty, and wants us to deny aging, it was helpful to me to be reminded that His priorities are so opposite the world’s. He sees beauty in maturity. I’m working with my friend to submit her manuscript to a variety of publishers, rather working like an (inexperienced) agent. One down, others yet to come. It’s exciting, and quite the learning experience. The Christian Writer’s Market Guide is my close friend. If you’re a pastor and have some interest in seeing prophetic art implemented in your church, or are already a published author, and are willing to review the manuscript and write an endorsement, leave a comment or e-mail me. We are OVER being sick. Four of the seven of us (including myself) got the flu this past week. Even “just” 8-12 hours is a long time, when one or more people are puking. I have worked hard this week on scrubbing five years of accumulated black gunk from about 800 square feet of ceramic tile grout. It feels very satisfying to have it done. I cleaned it with a paste of baking soda and water, scrubbed with a big scrub brush and an old toothbrush, then rinsed it three times both by hand, and with the bare floor function of my (Craigslist) carpet shampooer. The results are like night and day. I was thinking this week, how I’d really like to infuse my home with some additional/ better/ updated decorating, especially my kitchen and bathrooms. However, we don’t have the budget for it. So, I prayed. 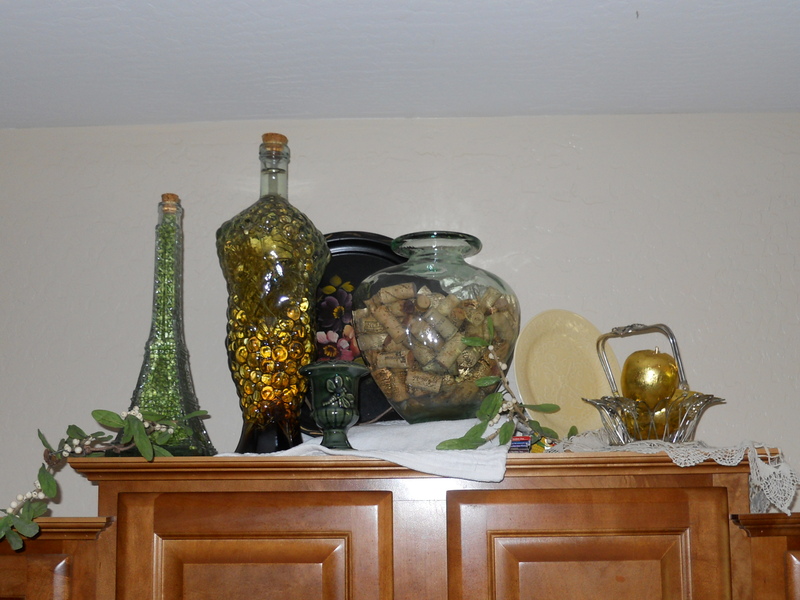 Literally, less than 24 hours later, someone offered some “decorative glassware” on Freecycle. The location of the offerer’s home coincided with a grocery store to which I needed to go. The glassware had a good 10 years of grease and pet hair gummed to their exteriors, and I was more than a tad grossed out. However, I attacked them with baking soda and dishwashing liquid, refilled some of them (with white vinegar & small, fresh rosemary branches, or dried beans), repaired one of them, and they look like new. Ten large jars, many bearing original price tags from Cost Plus and Pier One, for a total of at least $100 worth. I combined the jars with other things I already had… I’m really pleased with the outcome. God answers even silly prayers, and is so ready to bless His children! My dear son Wesley is going to a sleepover tonight. This is just the second mother in our history who has braved Wesley’s food and health difficulties, and I am giddy with pleasure both for Wesley, and in the mother herself. We spent 20+ minutes on the phone discussing menu plans and other accommodations. Honestly, I think it is her history as an elementary public school teacher that makes her so ready and experienced to do whatever it takes to keep Wes safe, and I’m really thankful for that. Taking Fiala off of potatoes was so beneficial, I hopefully thought, “Maybe what I thought was a corn reaction was really potato! Maybe she can really have corn!” So, last week, I tried her on corn for three days. That was dumb. Ever since, she has been SO itchy, poor girl. New lesions developed on her face, which she then scratched into oblivion, and are now infected. So, for the third time in less than six months, she’s back on antibiotics (Septra), as I wasn’t able to contain/control/heal the infection with topical bacitracin. 😦 Bummer. But, at least we know how to treat it, and at least I know now for SURE that corn is totally off-limits. Every couple of months, I try it, and I’m just not going to do that again, for a very long while. Though it would be so handy if she could eat corn, it’s just not worth it. Our dog, Tally, is recovering SO WELL from this most recent bout with Valley Fever. She is still on twice-daily fluconazole, but it is so encouraging to see her have her energy back, and she’s building muscle tone by eating extra food and zipping about the back yard. I’m in my final hours of ghost-writing the book I’ve been working on since February. Even though it seems like there has been continually “one more thing!” there really is light at the end of the tunnel now. Even though I have very much enjoyed work on it, I’m ready to be DONE with it. I hoped to be done yesterday. Then today… Nope. Still need work, probably 2-4 hours on both tomorrow and Friday. My husband’s brother, after not living on his own — EVER — for his first 40 years of life, moved to Colorado a couple years ago, and all but disappeared. But, after leaving a message for him at his church last week, we finally were able to get a hold of him, and are delighted that we will be able to see him later this summer during our family’s vacation. I haven’t blogged much lately. I have lots to say (probably too much! ), but not the time in which to do it. Part of me thinks, “But summer’s almost here!” yet I don’t want my summer to slide by, and the best I can say of it be, “Well, I got a lot of blogging done!” Ack. So, we’ll see. I already have way too much on my to-do list for summer. I am days away from finishing a book which I am ghost-writing for a friend, which I’ve been working on since early February. “For a friend”, yes, but she’s paying me, which has been lovely. I have tithed, and socked the rest of it away for our family vacation, and, hopefully, to go to my sister’s when her baby is born, VERY hopefully to be there for the birth itself. Speaking of birth, I am also eagerly anticipating the arrival of a friend’s baby. She was my acquaintance, but as I’ve spent a good amount of time with her in the last five weeks or so, I’m so pleased to say she’s now my friend. Her mother — who was a midwife — died when she was a little girl, and she was hoping for someone to step in and doula/be a labor coach. Our mutual friend connected us, and I have been so delighted to share with her both my knowledge, and my excitement. I think that has been the best thing: taking her concerns and turning them into joys, imparting hope, bringing encouragement and peace… We’ve talked on the phone, e-mailed, texted, visited at church, I’ve gone to a doctor’s appointment with her, we got to go out to lunch… It’s really been a lovely, lovely time. Now, her baby is seven days past his EDD, and I’m encouraging her to hang in there! Audrey was eight days “late” and I will freely admit that was the longest eight days of my life. It really looks, though, like the baby might make his appearance tonight or tomorrow, as it appears that my friend is in prodromal labor. Frankly, I am interested in too many things. It has been like that my whole life. Jack of all trades, in a way, and master of absolutely none of them. However, more and more clearly, I am honing my interest and time-spent in becoming more involved with birthing. I’d love to become a midwife, the prospect of which — though it would involve years of training — seems thrilling to me, not daunting. (I am easily daunted, especially by long tasks.) I’m not sure exactly what path that would take, but I’m pretty sure that I’m going to start by becoming certified to be a doula, and my goal for that is to complete my studies by the end of this calendar year. From there? Who knows. However, I LOVE birthing, and I love how God is such a wonderfully complex God that He made the process endlessly interesting, and that there is ALWAYS more to learn, and I love learning every bit about it that I can. My friend Erin used to blog semi-regularly, then pretty much stopped. The last couple of weeks, she has been regularly blogging about her baby, Abigail, which has been such fun to read. Erin’s a great writer, and Abi is so sweet and absolutely lovely, and I love seeing Erin be a mother. My friend Lisa wrote a great post, contrasting AA meetings with church, and, frankly, found church lacking in the support and transparency that she saw in the meeting. Real food for thought. My friend Nicole has a new blog, Modern Reject, which she is ambitiously filling with daily, meaty, honest, often humorous posts. Very worthwhile. We’re not schooling this week; I’m devoting as much time as I can to finishing the book that I’m ghostwriting for a friend. We’re going on three months now, and I am feeling a need to FINISH, and need devoted, multiple hours to do so. In bread news: My gluten-free vegan bread makes FABULOUS hamburger buns. 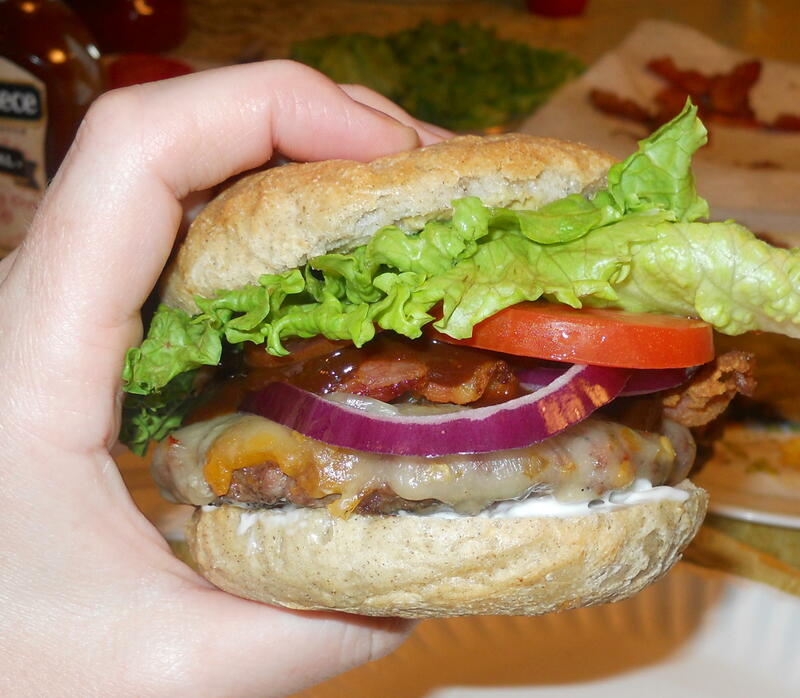 We had bacon cheeseburgers last night (at least, those of us who can have cheese did; the rest had bacon hamburgers). Yum. It’s just going to take a little while to get the entire post together — there are lots of notes on ingredients and technique for the recipe, as well as a ton of pics. Hopefully, I’ll have it done some time this week, though!